I was meant to be hiker trash. Not showering for days at a time doesn’t bother me; I often go multiple days IRL without showering when I can get away with it. And as much as I like having silky-smooth legs, shaving is a hassle and I always look forward to the short Texas winters where I abstain from razors for a few months. Ditto for makeup. I enjoy dressing up and looking nice sometimes, but more often than not I wear makeup out of a feeling of obligation. Even though my makeup routine at home is pretty minimal, I can’t wait to wake up on trail where my morning routine consists only of breaking camp and getting some calories in. Here’s everything hygiene related that I’m carrying. I’ve been using this little pee stick since I was a lowly day hiker. This .63-ounce hunk of plastic saves me from peeing all over my ankles, or from squatting on poodle dog bush. This is what I use for my pee rag. Bamboo is antimicrobial, antifungal, antibacterial, and dries super fast. It came in a pack of six from the Amazon Baby department. Another thing about these washcloths that I like is that the tag is a loop, which makes it easy to hook onto my pack. I trimmed it down to about the size of my palm and hemmed it up because a full-size washcloth was overkill. Everyone talks about using the DivaCup but did you know there are other brands? I started with the DivaCup in 2013 and haven’t put a tampon in my body since. The same cup lasted me four years until I decided to try this one. I recommend menstrual cups to anyone who has a period, on the trail or otherwise. Shop around because there are plenty of great period cup options out there. Tip: heavy exercise and altitude can make your period unpredictable. 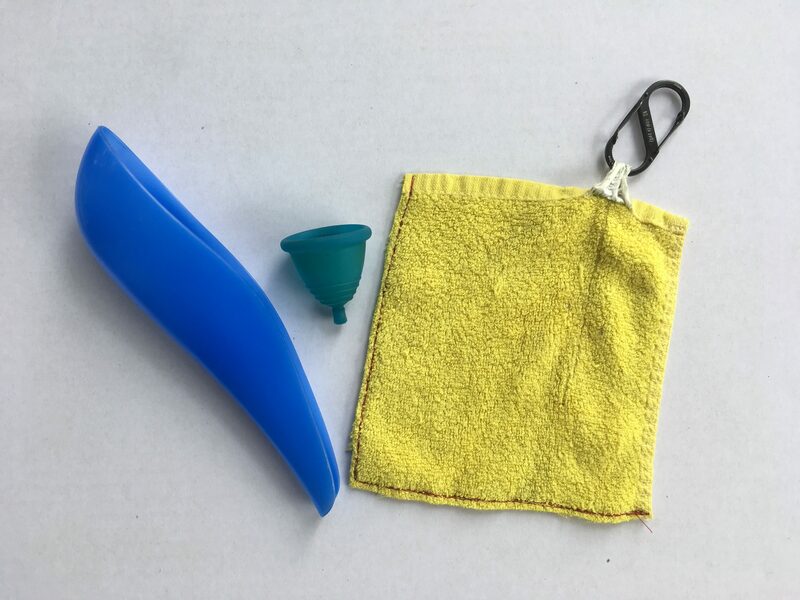 Menstrual cups are so light and tiny that you have to reason not to carry it with you the entire trail. Another staple gear piece. Hack: use it as a shoehorn. Dollar Tree unscented hand sani. Hack: don’t worry about mailing yourself mini hand sani bottles throughout the trail, simply refill in town when you’re running low. 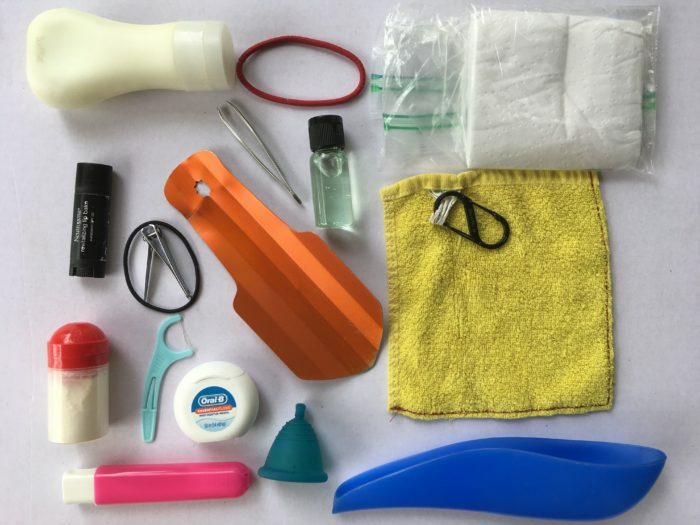 Public restrooms or the hiker box are great places to find a refill. I can’t get behind the idea of a travel bidet so I use good old fashioned toilet paper. Pack out your toilet paper! It’s really not that gross. I keep used ziplock bags and reuse them as single-use trash bags for TP. These sealed trash bags then go in with my main trash bag (which is also a ziplock bag) inside my Opsak. If you keep all your trash together, it’s easy to throw it away if you happen upon a maintained campsite or with trail angels who offer to take your trash. Compact when not in use. Assembles to full-size toothbrush. As long as I brush my teeth before I go to sleep and after I eat breakfast, I feel clean and new. 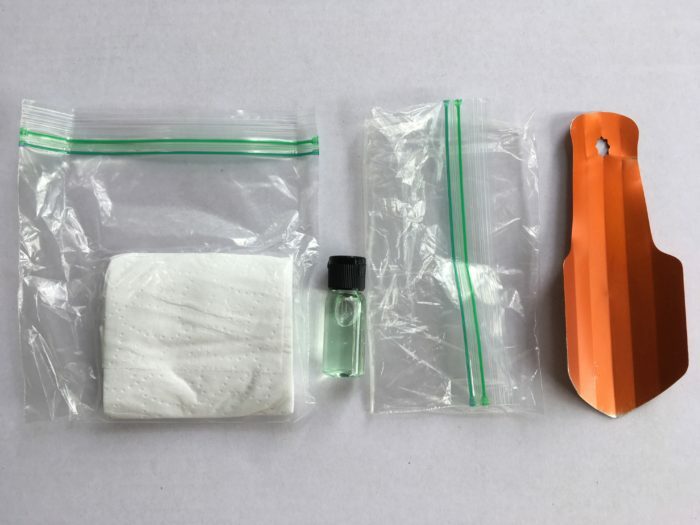 I recently learned about this magical toiletry item called tooth powder through another Trek article. This stuff is basically dehydrated toothpaste — I divided it into one-ounce bottles that will last me about 50 days each. I won’t have to worry about mailing myself tiny tubes of toothpaste. The taste is a little shocking after using artificially flavored toothpaste all my life but I’ll get used to it. 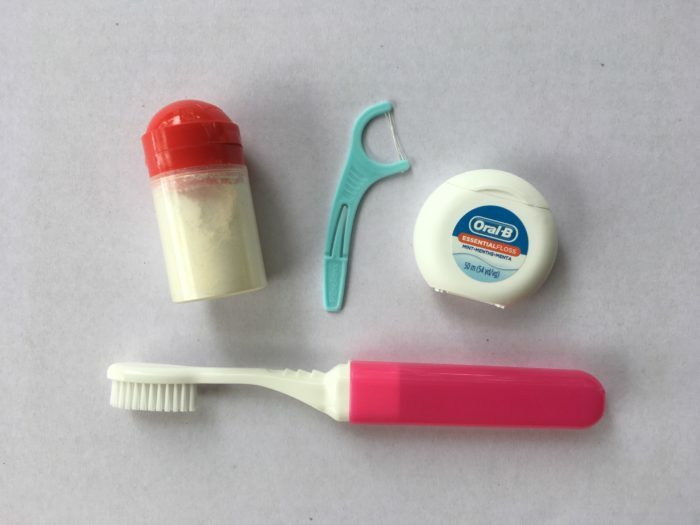 Tooth powder definitely seems like the more eco-friendly choice both on the trail and at home. My teeth and gums were perfectly healthy when I started the Colorado Trail. I decided not to worry about flossing. Five weeks and I’d get back to my routine, no big deal. Not even two weeks in and my gums bled whenever I brushed my teeth and continued to do so long after I got home from the trail. At a mere .46 ounces for a new pack of dental floss, it’s not worth it to neglect flossing for any amount of time. Lesson learned. Single-use product that can actually be used multiple times. I use any cheap lip balm IRL but splurged on this stuff for the trail because of the SPF. This is my fav sunscreen ever. After it sets in, it stops feeling greasy and gross. I’ll carry three ounces at a time and I’ll be wearing a long sleeve in the desert so all I have to worry about is my head, hands, and legs. For cactus thorns and bushy eyebrows. I can’t stand having long fingernails at home but especially on the trail. And keeping toenails trimmed keeps your toes and feet healthy. Always good to keep a couple extra. For hair or for tying stuff together.